Mo2Go delivers on the promise of the digital video revolution. Where impossible before, imagine 2 hours of HD video content delivered in approximately 1 minute to any smart device free from interruptions, delays and other connectivity issues. Now possible, the Mo2Go software App provides fast reliable wireless delivery of video content. Mo2Go creates a new, lucrative revenue stream from delivery of diverse video content (entertainment, health, education, sports, etc.) and advertising to millions of untapped End Users that are unable to stream/download. Mo2Go is perfect for bandwidth constrained areas such as emerging countries, high traffic locations (malls, airports, trains, etc. ), and rural communities. This is potentially billions of gained revenue. The Mo2Go advantage over current traditional streaming and downloading is reliability (no buffering, etc.) and speed (2 hour movie in approximately 1 minute). Traditional streaming or downloading requires an Internet connection, which can be problematic due to increasing bandwidth limitations. Bandwidth is being throttled with many people streaming/downloading video content. The premium Mo2Go solution solves this by “Wireless Downloading” without the open Internet, when in range of a Mo2Go SpeedSpot server. Endless movies and other content can be downloaded by multiple End Users simultaneously exactly like Netflix, Amazon Prime and Apple, etc. only Extremely Fast and Interruption-Free! Mo2Go deployment is cost-effective. Mo2Go, a scalable, simple modular solution, distributes content to offline media caches. This allows delivery to be independent from bandwidth constraints, alleviating massive strain on the network and postponing costly infrastructure upgrades. Mo-DV is seeking Partners to license Mo2Go, and is in progressed meetings to install Mo2Go worldwide. A win for both End Users and our Partners, the Mo2Go solution creates a premium experience that encourages loyalty and repeat transactions. A demo can be viewed at Mo2Go in action. Mo2Go is a software app for fast reliable wireless delivery of video content. Mo2Go delivers on the promise of the digital video revolution. End users receive a premium service that is fast and reliable, free from interruptions, delays and connectivity issues. With Mo2Go, the average 2 hour HD movie can be downloaded in approximately 60 seconds. Please see the demo of Mo2Go in action. Reach New Markets – Leverage your existing infrastructure to extend access to content where access has been prohibitive in the past. By eliminating the buffering and latency issues so common in streaming, your current network can now serve the content that was simply too bandwidth intensive before. Tap into New High Margin Revenue Streams – Attract new end users by expanding service offerings. Have flexibility to package your services according to market demand, including premium pricing for the latest formats like 4K and 8k. Expand Fast – Deployment is cost-effective, making expansion easy to gain market presence and penetration. The Mo-DV patented Mo2Go Product Suite is today’s solution for mobile delivery and next generation media needs. Rapid and secure content delivery (e.g. a 2 hour HD video in approximately 60 seconds), increasing content sales. Allows partners to take advantage of the exploding growth in the quantity and quality of mobile content to smart devices. 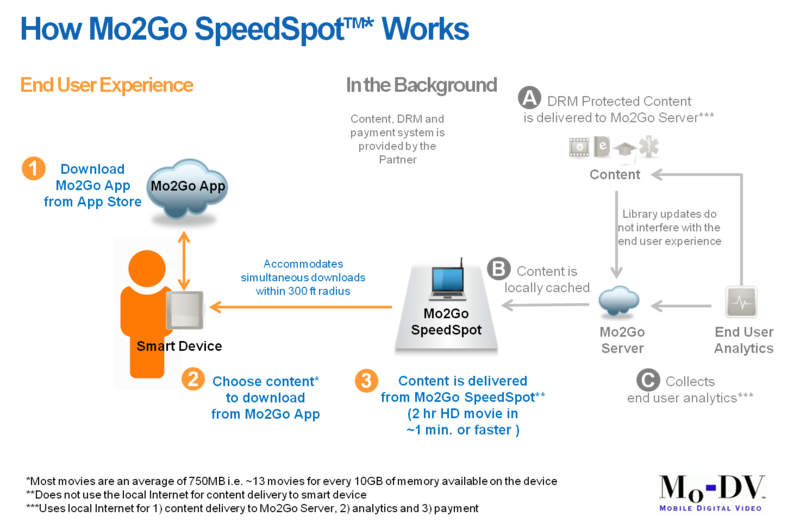 Mo2Go SpeedSpot securely delivers content faster than ever before.